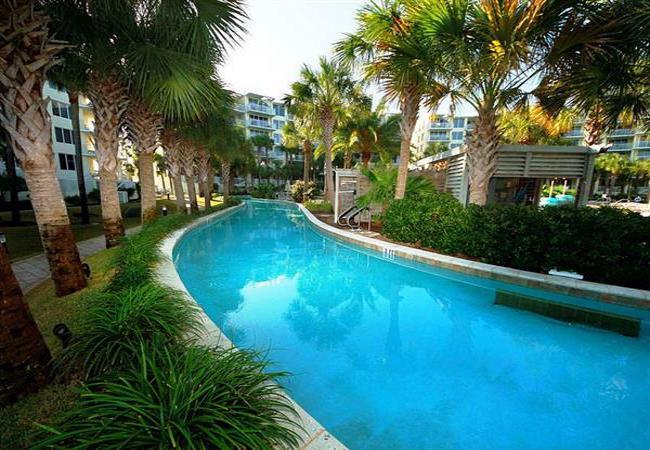 Discover the perfect beach retreat along the Emerald Coast at our gorgeous Okaloosa condos! The Destin West Beach and Bay Resort is situated in an ideal location just minutes from Destin along the east side of Okaloosa Island. As a result, enjoy being close to the action yet still far enough away to appreciate the peace and serenity of the resort. We have beachfront condos with views of the Gulf of Mexico, as well as bay front units that overlook the scenic Choctawhatchee Bay and our beautiful tropical pool. Spend your days at our Destin condo rentals relaxing by the pool, strolling along the beach, or floating through the bayside lazy river. In the evening, you can look forward to a delightful night of rest in our comfortable and roomy accommodations. We offer a wide selection of affordable vacation condos that are designed to meet every taste and budget. Select from our 1, 2 or 3 bedroom condos with views of the Bay or Gulf, or book one of our highly rated Villa Efficiencies. For a truly special getaway, we even have penthouses with private rooftop terraces and hot tubs! Regardless of your decision, each accommodation has all the amenities necessary for a delightful stay in the Destin area. All accommodations conveniently feature a full kitchen with dishwasher, and all units except for the villas contain a washer and dryer. The Destin West Beach and Bay Resort has many wonderful resort amenities for you, making it a fantastic destination for both couples and families. Grab a tube to enjoy the lazy river, or take advantage of our 7 tropical pools spread throughout the resort. For families with young kids, we offer seasonal children’s activities for hours of fun entertainment. Other great amenities at our resort include on site check-in services, coastal beach service and rentals, and a state-of-the-art fitness center. You will never run out of fun things to do when staying on Okaloosa Island! The island features a virtually endless list of activities to appeal to guests of all ages. The island is home to attractions such as the Gulfarium Marine Adventure Park, Wild Willy’s Adventure Zone and Fat Daddy’s Arcade. Once you have worked up an appetite, enjoy one of the many local restaurants on the island such as Angler’s Beachfront Restaurant, the Black Pearl or Fudpucker’s. As an alternative, you can pick up some groceries and prepare dinner in the comfort and convenience of your own condo. Regardless of how you decide to spend your vacation with us, our Okaloosa Island condo rentals have everything you need for a fantastic getaway.